Make presentations, share applications, update spreadsheets—share anything on your screen—with anyone, anywhere. 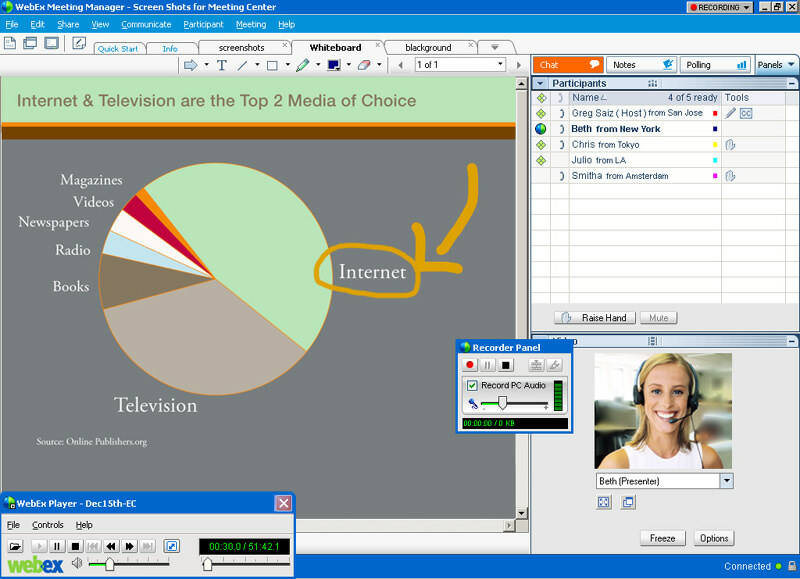 It’s easy with WebEx. Meet online with customers, partners, and colleagues, wherever they are, as easily as if you were face-to-face. Schedule meetings in advance or start an instant online meeting and invite people to join you by email or IM. Pass control from your screen to theirs at any time. And share high-quality video for a more collaborative experience – WebEx Meeting Center supports multiple, simultaneous webcam streams at 640x360 resolution. If you need more information please contact the developers of WebEx Meeting Center (Cisco Systems, Inc.), or check out their product website.